It’s been over a week now since we returned from PAX, and it feels like we’re all still recouperating (I slept through my alarm today). We are still learning how to better run Pixelscopic (we just set up Ventrilo, which was a minor communication breakthrough). And we are still catching up with all of the great people we met, and staying abreast of all of the great press we are getting on Delver’s Drop — which at this point I’ll just call DDrop for simplicity. The name’s not really that difficult to get out until you’ve said it about 500 times in 3 days. Ryan Baker (far left) talking to a handful of our several hundred booth-goers. 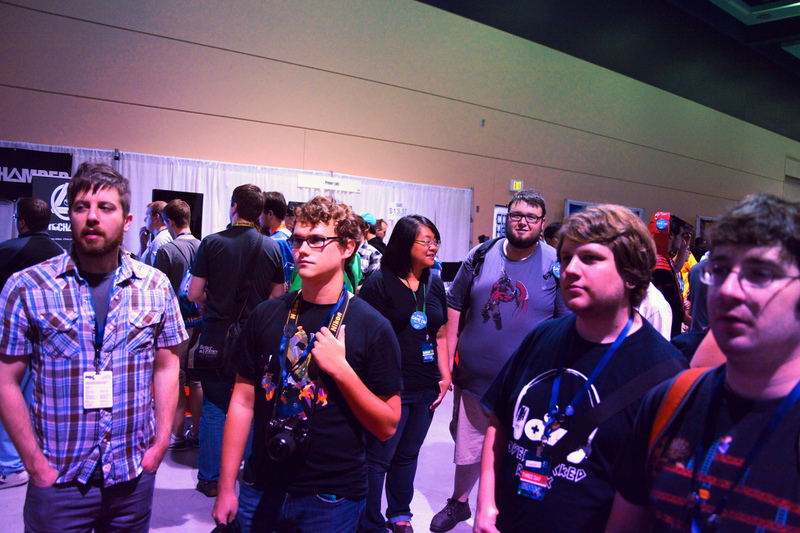 For all four of us on the team, there were moments leading up to the conference (perhaps quite a few) when we actually thought about bailing out of the Megabooth and not exhibiting, due to a lack of confidence in the game’s very early, incomplete state. This may surprise you if you’ve seen any of the several articles that have been posted on Delver’s Drop recently (like the ones here, here, and here), and the fact that Game Informer named it one of their 9 “Standout Titles of PAX’s Indie Mega Booth.” Out of over 30 games, that’s more than decent, considering that DDrop had only been in full development for just under a month. But knowing what we wanted the game to be, and the fact that the PAX build as it stood was nowhere near this in the days leading up to the show — even the day of the show — had put us all in one of the most dour states we had seen since we started Pixelscopic. I’m just not the kind of person who cuts corners on anything. I know what a game announcement should look like — you have a nice trailer, send out press releases, hit the social media, hope you get something to go viral, increase mind-share, and all of the other PR buzz-word concepts. They form a pretty simple checklist of the things-you-should-do if you want people to know about your game. All we had was a quite honestly rushed demo and a couple of vague tweets. There just simply hadn’t been time to do everything we had wanted or even needed to do after wrapping up our previous obligations. We simply showed up the day before PAX, plugged in the laptop, which for all we knew could have been the only machine in the world that ran the game at full frame rate. 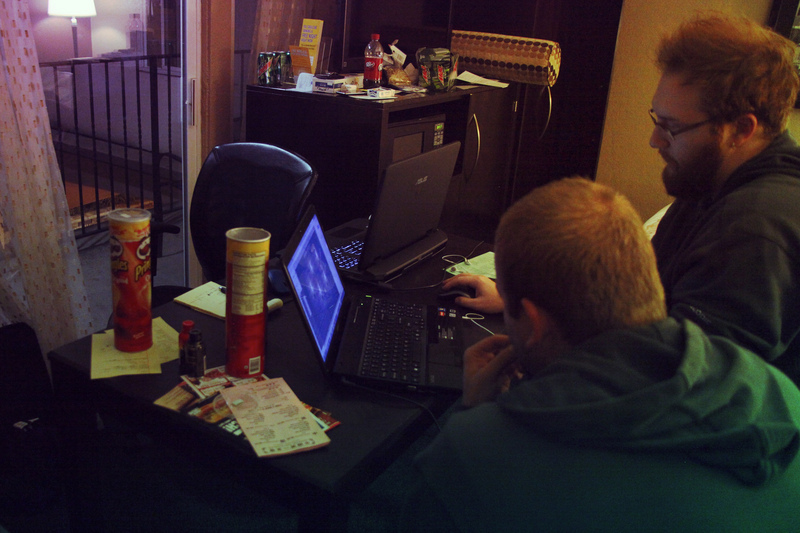 Then we made sure it looked okay and ran in 1080p on the TV (kindly provided by Intel and Kelly Wallick’s efforts), discovered a UI bug that caused things to be cut off, and Coby, Ankur, and Burrell went back to the hotel to keep working. I finished setting up the booth, then went back to do the same. We were all either beyond the point of exhaustion where you no longer have the option of feeling stressed, or maybe in that moment even cursing the day we signed up for the Megabooth. Coby and Ryan Burrell working at the hotel. We even moved in an extra table and chair(s) from the other room. There were a lot of mistakes along the way, but perhaps the biggest was this consistent feeling that not only would we find ourselves fluctuating between obscurity and criticism when the expo opened the following day, but that we would be have actually embarrassed ourselves among our peers. And our PAX experience proved us all wrong. What we had was not a finished game, a polished version of a game, and in my often overly critical eyes, barely a prototype of what is to come in the future. But what we did have on our hands was a short demo exuding a flavor for which a large portion of our gaming audience seemed to be ravenous. If 2-D, top-down action games with more contemporary trappings in physics, graphics, and sheer speed were the recipe, the minuscule appetizer we brought to PAX left our patrons asking for the entrée. Sorry, but it’s still got about 8 – 9 months of development to go! I say this not with pride, but with humility. One could also attribute our previous gloominess to the you-are-your-own-worst-critic phenomenon, which I will be the first to admit. But not only did we underestimate that people would like it; we were afraid no one would give it a second look. We severely underestimated what we had created, which is perhaps the worst kind of underestimation, since we knew every strength and weakness of the project. It could easily be chalked up to ignorance of the PAX dynamic, since even though we had attended, we had never run a booth anywhere. As Ryan Burrell mentioned, we even ran out of pins and postcards. Twice. Our cards and pins ran out & we had to rush a new order… at 3pm the first day. I also found out things about myself that I did not previously know; for instance, that despite being a pretty severe introvert, I actually enjoy talking to a couple hundred people a day about the project that I am most passionate about. I got more compliments on the art style (or Ankur directing people to me to talk about the art) than I even still feel like I deserved after only coming up with one character and one environment tile set. Maybe I got into a bit of a sales-pitch rut while talking about the game (sorry if you were one of the few hundred and found it annoying), but I didn’t realize how excited I was to tell everyone about our ideas for DDrop. After interacting with the first few people, I had gone from not wanting to acknowledge the roughness of the demo to proudly telling people that we had been working on it for less than a month. 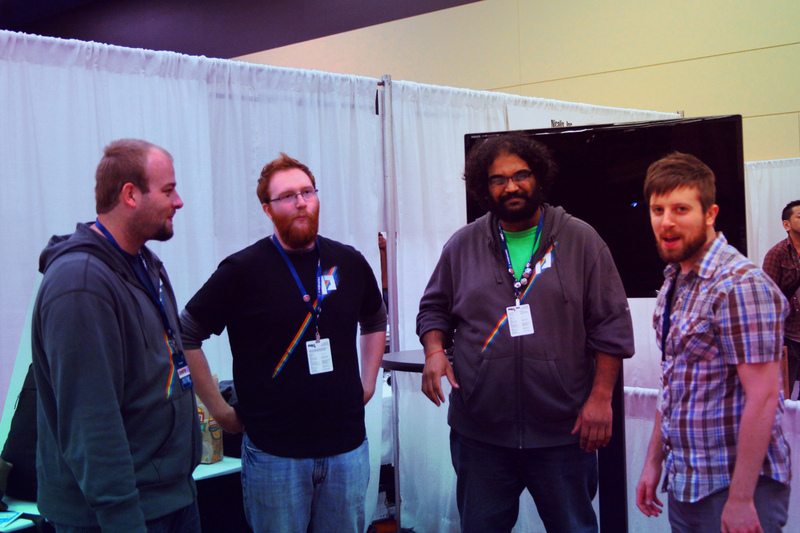 My favorite part of the running the booth was listening to Ankur have people guess how long we had been in development. “18 months?” they would ask. “No, Lower.” You get the idea. 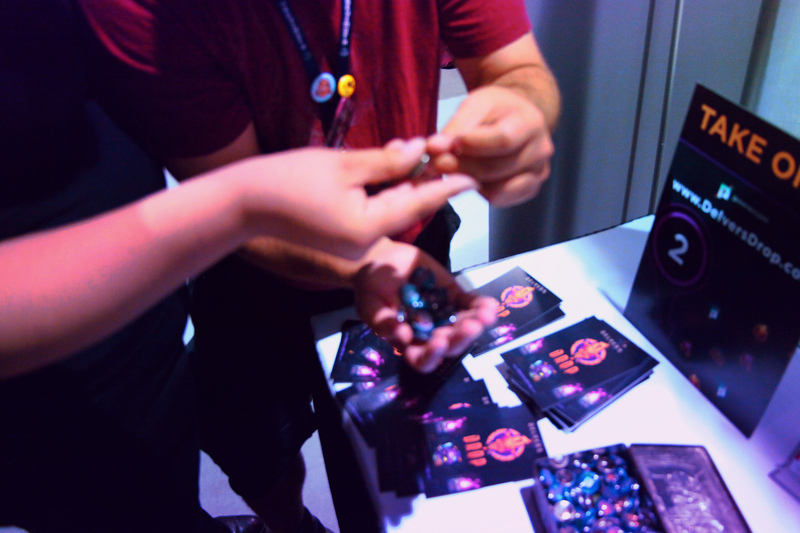 Saying that PAX was unpredictably successful for us does not begin to describe the complete turnaround we experienced — from the short-sighted dev-grind negativity to our current state of refreshed energy and optimism, and reinvigorated determination to live up to the praise we received at PAX. Back when we talking about making this game and showing it at PAX this year (the details are now somewhat foggy), I told Coby, who is my business partner and co-founder of Pixelscopic, that we had to roll the dice this year. Meaning that if we were going to create the kind of studio we wanted, and create the kinds of games we wanted, we had to take some huge gambles. These were gambles both in the sense of risking our reputations and in the sense of dropping money on something like a PAX booth with no guarantee that it could take us anywhere. Other than the obvious possibility of taking us out of business. And while it did not immediately land us a pile of money or diehard fans (let’s hope for those in the near future), it did breath new life into our passion for what we do, and our goals for Delver’s Drop. Pixelscopic Team Post-PAX. Left to Right: Coby, Ryan Burrell, Ankur, Ryan Baker. This entry was posted in News and tagged company news, Delver's Drop, editorial, Megabooth, PAX by Ryan Baker. Bookmark the permalink.